The circulatory system develops initially via vasculogenesis, with the arterial and venous systems developing from distinct embryonic areas. The aortic arches are a series of six, paired, embryological vascular structures that give rise to several major arteries. The first and second arches disappear early. The third arch becomes the carotid artery. The fourth right arch forms the right subclavian artery, while the fourth left arch forms the arch of the aorta. The fifth arch disappears on both sides.The proximal part of the sixth right arch persists as the proximal right pulmonary artery. The sixth left arch gives off the left pulmonary artery. Approximately 30 posterolateral branches arise off the dorsal aortae and will form the intercostal arteries, the upper and lower extremity arteries, the lumbar arteries, and the lateral sacral arteries. The lateral branches of the aorta form the definitive renal, suprarenal, and gonadal arteries. The ventral branches consist of the vitelline and umbilical arteries. The vitelline arteries form the celiac, and superior and inferior mesenteric arteries of the gastrointestinal tract. After birth, the umbilical arteries will form the internal iliac arteries. The venous system develops from the vitelline veins, umbillical veins, and the cardinal veins, all of which empty into the sinus venosus. sinus venosus: A large quadrangular cavity that precedes the atrium on the venous side of the chordate heart. In humans, it exists distinctly only in the embryonic heart, where it is found between the two venae cavae. aortic arches: Also known as pharyngeal arch arteries, this is a series of six, paired, embryological vascular structures that give rise to several major arteries. They are ventral to the dorsal aorta. cardinal vein: The precardinal veins or anterior cardinal veins contribute to the formation of the internal jugular veins and, together with the common cardinal vein, form the superior vena cava. In an anastomosis by anterior cardinal veins, the left brachiocephalic vein is produced. The human arterial system originates from the aortic arches and from the dorsal aortae starting from week 4 of embryonic life. The development of the circulatory system initially occurs by the process of vasculogenesis, the formation of new blood vessels when there are no preexisting ones. Embryonic cardiovascular system: A profile view of a human embryo estimated at twenty or twenty-one days old. Vasculogenesis is when endothelial precursor cells (angioblasts) migrate and differentiate in response to local cues (such as growth factors and extracellular matrix) to form new blood vessels. The human arterial and venous systems develop from different embryonic areas. The aortic arches—or pharyngeal arch arteries—are a series of six, paired, embryological vascular structures that give rise to several major arteries. They are ventral to the dorsal aorta and arise from the aortic sac. Aortic arches: A schematic of the aortic arches and their arterial destinations. The first and second arches disappear early, but the dorsal end of the second gives origin to the stapedial artery, a vessel that atrophies in humans, but persists in some mammals. It passes through the ring of the stapes and divides into supraorbital, infraorbital, and mandibular branches that follow the three divisions of the trigeminal nerve. The infraorbital and mandibular branches arise from a common stem, the terminal part of which anastomoses with the external carotid. On the obliteration of the stapedial artery, this anastomosis enlarges and forms the internal maxillary artery; the branches of the stapedial artery are now branches of this vessel. The common stem of the infraorbital and mandibular branches passes between the two roots of the auriculotemporal nerve and becomes the middle meningeal artery. The original supraorbital branch of the stapedial artery is represented by the orbital branches of the middle meningeal artery. The third aortic arch constitutes the commencement of the internal carotid artery, and is named the carotid arch. The fourth right arch forms the right subclavian artery as far as the origin of its internal mammary branch. The fourth left arch constitutes the arch of the aorta between the origin of the left carotid artery and the termination of the ductus arteriosus. 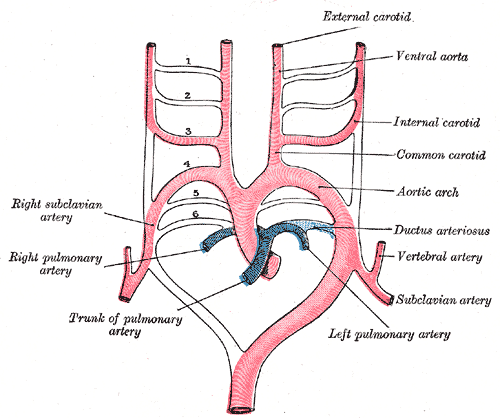 The fifth arch disappears on both sides.The proximal part of the sixth right arch persists as the proximal part of the right pulmonary artery, while the distal section degenerates. The sixth left arch gives off the left pulmonary artery and forms the ductus arteriosus. This duct remains during fetal life, but closes within the first few days after birth due to increased O2 concentration. This causes the production of bradykinin which causes the ductus to constrict, occluding all flow. Within one to three months, the ductus is obliterated and becomes the ligamentum arteriosum. The dorsal aortae are initially bilateral and then fuse to form the definitive dorsal aorta. Approximately 30 posterolateral branches arise off the aorta and will form the intercostal arteries, upper and lower extremity arteries, lumbar arteries, and the lateral sacral arteries. The lateral branches of the aorta form the definitive renal, suprarenal, and gonadal arteries. Finally, the ventral branches of the aorta consist of the vitelline arteries and umbilical arteries. The vitelline arteries form the celiac, and superior and inferior mesenteric arteries of the gastrointestinal tract. After birth, the umbilical arteries will form the internal iliac arteries. 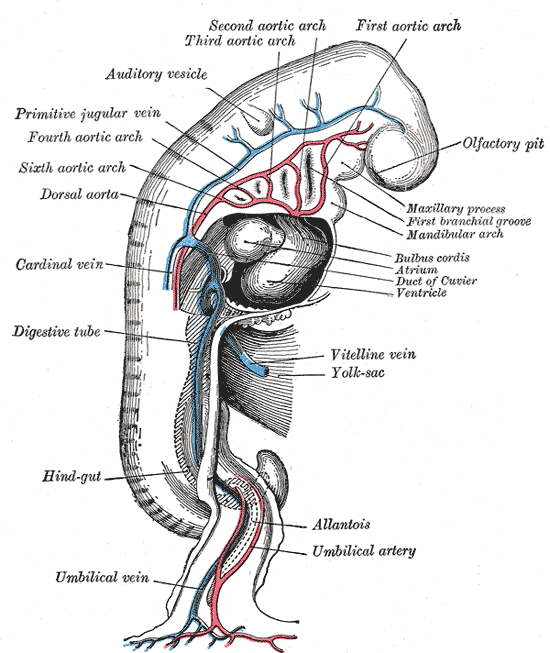 The human venous system develops mainly from the vitelline, umbilical, and cardinal veins, all of which empty into the sinus venosus. The venous system arises during the fourth to eighth weeks of human development. Most defects of the great arteries arise as a result of the persistence of aortic arches that normally should regress or due to the regression of arches that normally should not. A double aortic arch occurs with the development of an abnormal right aortic arch, in addition to the left aortic arch, forming a vascular ring around the trachea and esophagus, which usually causes difficulty breathing and swallowing. Occasionally, the entire right dorsal aorta abnormally persists and the left dorsal aorta regresses. In this case, the right aorta will have to arch across from the esophagus, causing difficulty breathing or swallowing.